NEW YORK -- President-elect Donald Trump agreed Friday to pay $25 million to settle several lawsuits against his now-defunct school for real estate investors, averting a trial in a potentially embarrassing case that he had vowed during the campaign to keep fighting. 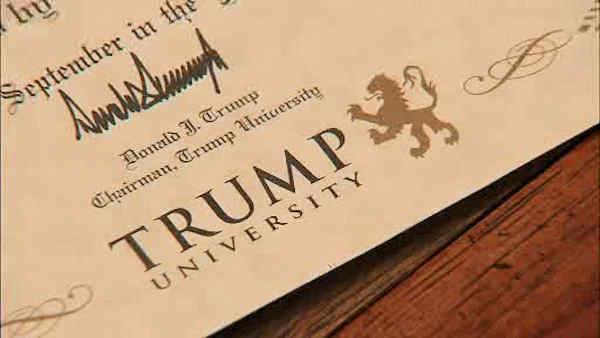 If approved by a judge, the deal announced by New York Attorney General Eric Schneiderman would lay to rest allegations that Trump University defrauded students who paid up to $35,000 to enroll in programs that promised to share Trump's secrets of the real estate industry. The deal would settle a lawsuit Schneiderman filed three years ago and two class-action lawsuits filed in California on behalf of former students. The complaints accused the program of misleading students by calling itself a university when it was not an accredited school and by saying that Trump "hand-picked" instructors. Trump has denied the allegations and repeatedly said he would not settle. He told supporters at a May rally that he would come to San Diego to testify after winning the presidency. "I could have settled this case numerous times, but I don't want to settle cases when we're right. I don't believe in it. And when you start settling cases, you know what happens? Everybody sues you because you get known as a settler. One thing about me, I am not known as a settler," Trump said at the time. The deal does not require Trump to acknowledge wrongdoing. In a statement, Trump's attorneys said they had "no doubt" that Trump University would have prevailed in a trial, but "resolution of these matters allows President-elect Trump to devote his full attention to the important issues facing our great nation." Schneiderman said the $25 million to be paid by Trump or one of his business entities includes restitution for victims and $1 million in penalties to the state. Trump "fought us every step of the way, filing baseless charges and fruitless appeals and refusing to settle for even modest amounts of compensation for the victims of his phony university. Today, that all changes," Schneiderman said in a statement. He called the settlement "a stunning reversal by Donald Trump and a major victory for the over 6,000 victims of his fraudulent university." Plaintiffs' attorney Jason Forge says all 6,000 people in the class-action case will get at least half their money back, and some receive a full refund. Forge said he "definitely detected a change of tone and change of approach" from Trump's camp after the election. A federal judge in California had been set Friday to consider arguments on Trump's latest request to delay a trial until after Trump's inauguration on Jan. 20. After the settlement was announced, the trial was canceled. The Trump Organization is a party to numerous lawsuits that threaten to prove a distraction in his administration. The settlement comes a day after watchdog groups and ethics experts who served in both Republican and Democratic administrations sent a letter to Trump urging him to make a clean break from his business to avoid "embroiling the presidency in litigation." One of the authors, Richard Painter, an ethics lawyer at the White House under George W. Bush , said he thinks the Trump University settlement might backfire if lawyers think Trump is eager to settle to avoid court cases while president. "The plaintiffs' lawyers are going to smell blood in the water," he said. Trump's attorneys said in a court filing last week that preparations for the White House were "critical and all-consuming." Six months ago, when they unsuccessfully sought a delay until after Inauguration Day, lead attorney Daniel Petrocelli said the period between the election and swearing-in is hectic for a president-elect but that it was preferable to a trial during the campaign. "The task is momentous, exceedingly complex, and requires careful coordination involving the respective staffs and teams of both President (Barack) Obama and President-elect Trump," Trump's attorneys wrote. "In fewer than three months, the President-elect must be prepared to manage 15 executive departments, more than 100 federal agencies, 2 million civilian employees, and a budget of almost $4 trillion." Trump's attorneys also raised the prospect of having the president-elect testify by video recording before the trial begins in the class-action lawsuit on Nov. 28.